This handbook has been produced to assist Beaver Masters in running their Section efficiently. The theme for the Beaver programme is based on the book 'The Friends of the Forest' that it is advised a copy is obtained for the Colony. The object of the Beaver Section is to provide a happy friendly section for the younger boy and girl members of the BBS, where they can take part in suitable activities appropriate to their ages and development prior to entering the next Section, the Wolf Cubs. Beavers was started by overseas scout associations in about 1980 or maybe before, and also adopted by scout associations in the UK at that time or very shortly after. The BBS already had notes concerning the formation of such a section in the pre-junior section and was already catered for under Section 6 of the 'Official Handbook' of 1930s with revisions in July 1983. The Section will be known as the Beaver Colony. This will be divided into Lodges comprising six members or thereabouts. The Section will be an integral part of the Scout Group and will be known by the Group Title. 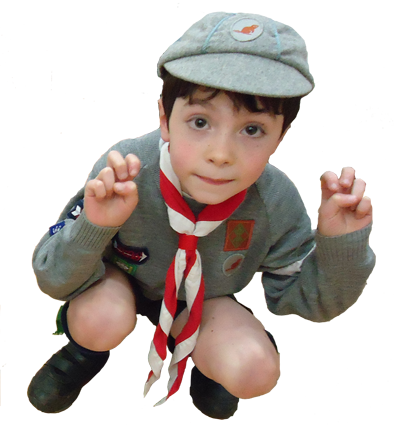 A Beaver Colony must form part of a BBS Scout Group, and the Scout Group must register the Beaver Colony under their Scout Group Registration, as for all Sections. The Beaver Scouters/Officers must apply for the appropriate warrant for their rank, the forms for which are available from the Group Scout Master or from the BBS Headquarters. Please note that a Beaver Colony may be permitted to be formed in advance of a full Scout Group being established with the approval of the BBS Headquarters. The Association's policies and procedure for these are obtainable on request from the BBS Headquarters. All warranted Scouters/Officers will need to complete forms relating to these policies and undergo checks to ensure that the Association policies are being fully complied with. The Scout Group is responsible for their own Public Liability and any Personal Injury insurance that must be in line with the BBS Headquarters' requirements in order to qualify for registration of the Association. There is a non-warranted rank of 'Beaver Instructor' who will be uniformed and may be a Senior Scout, a Rover Scout or other persons suitable for this role who would have undergone the required checks for a Scouter/Officer. The titles or names for the Beaver Colony Scouters/Officers are taken from the book 'Friends of the Forest' that the theme of Beavers is taken from. Therefore the name 'AHMEEK' must be used for the Beaver Master. Names for Assistant Beaver Masters and for Instructors and any adult helpers will be left to the discretion of the Section concerned, but the names that can be selected from are ~ 'Keema'; 'Keeo'; 'Grey Beaver'; 'Brown Beaver'; 'Black Beaver'; 'Tictac'; 'Rainbow'; 'Kiggiark' (Eskimo); 'Rusty'; 'Bubbles' Or 'Malak'. Beaver Masters and Assistants wear the appropriate enamelled hat badge bearing the Beaver emblem and worn on the front of the leather hat band. The Beaver Master wear the badge with a 'GREEN' background and an Assistant wear the badge with a 'RED' background. Instructors (Auxiliaries) wear the badge with a 'YELLOW' background. Shoulder knots are worn at the top/shoulder seam of the shirt left arm comprising four strands of 'GREEN' ribbon for the Beaver Master and a similar in 'RED' ribbon. Colony Instructors (Auxiliaries) will wear similar but with 'YELLOW' ribbon. The shoulder knot colourings are the same for all Sections within the Scout Group. The training of Beaver Scouter/Officers follows the same course as for all other Sections, consisting of a 'Preliminary Training Course' (PTC) that will probably be carried out over a weekend, or two day sessions or maybe several evening sessions. At the end of the course a Certificate will be issued and a two-stranded Turk's Head Woggle will be presented. After completing the PTC comes the 'Part 1 Correspondence Element' consisting of three Studies, each Study consisting of questions to which you, as the Candidates, will have to find the answers by either reading or in discussion groups with others. Each Study will be checked by a Reader appointed for that purpose and then the next Study can be undertaken. On completion of the Correspondence Element a further Certificate will be issued. Following this will be the 'Part 2 Practical Residential Course' over a long weekend or several short weekends, in which the practical skills of Scouting will be presented. A further Certificate will be issued on Completion of 'Part 2'. 'Part 3 Probationary Period', a probationary period usually of around three months will then take place, after which a report will be submitted by the Group Scout Master, on the suitability of the candidate in putting into practice what has been learned during the 'Wood Badge Training'. When a recommendation as to the suitability has been received by the Trainers, a further Certificate will be issued, together with the 'Wood Badge' insignia proper and the 'Order of World Scouts' Wood Badge neckerchief. Whilst the above is not compulsory, it is hoped that all Scouters/Officers will want to become as proficient as possible and will undertake that training. We can all benefit from an exchange of ideas which is inevitably a product of such training. SAFETY IN THE DEN/HALL Where there are boisterous games it is necessary to remove out of harm's way all things that are likely to cause injury, e.g. tables and chairs, ropes and other equipment not required for that game and especially sharp or pointed objects. Look out for things likely to lead to accidents. SAFETY ON THE ROAD The 'Green Cross Code' is an essential part of our Scouting programme and all Beavers should be taught this, and always ensure that when you are out with the Beavers you make a point of being seen to abide by the 'Green Cross Code' to the Beavers. If the situation of your meeting hall is one that the Beavers need to leave by crossing a road, then ensure that there is a Scouter/Officer appointed to that role of safely crossing the Beavers. PARENTS should be asked to ensure that they are there on time to deliver and collect their child before and after each meeting, but still ensure that there is at least one Scouter/Officer on any exit door to supervise the arrival and departure of the Beavers at each meeting. FIRST AID All Colonies should have to immediate hand a comprehensive First Aid Kit. This should contain the normal requirements items for dealing with cuts and scratches, grazes and bruises. In addition a small note book to record any details of injuries sustained and the treatment given and by whom, along with the name of the Beaver, the date and time and finally the location. A current edition of the First Aid Manual issued by the British Red Cross or similar authority must be kept in the First Aid Kit. Any head injury which appears to have concussed the injured person should be dealt with at the nearest hospital. Wherever possible one of the Scouters/Officers in the Colony should be trained in First Aid and preferably hold a valid STA 'Activity First Aid' and 'Emergency First Aid Ay Work' Certificate, or have attended a First Aid Course offered by the British Red Cross or similar authority to the same level. On all outings CARRY A FIRST AID KIT. IF YOU ARE NOT EQUIPPED TO DEAL WITH A SPECIFIC INCIDENT, GET SOMEONE WHO CAN. Colony meetings should be arranged to suit the younger age group and should normally not be later than early evening. Meeting should not normally last more than two hours, usually one and a half hours should be sufficient and is the recommended length of time for a Colony meeting. It is advisable that a Colony Council meeting should be held at regular intervals. This is an informal meeting of the Colony Scouters/Officers with any Beaver Instructors working with the Section, to discuss programmes and activities. Membership subscriptions should be levied on the individual Beavers. This should be determined by the Group Scout Master in consultation with the Beaver Master and should be a reasonable amount, bearing in mind local conditions and expenses incurred in running the Beaver Colony as a part of the Scout Group. The monies must be properly accounted for and banked with the Scout Group Treasurer, and the monies expended at the discretion of the Group Scout Master in consultation with the Beaver Master. A float could be issued for the Beaver Master's accountable cash purchases for the Beaver Colony. Both Boys and Girls are eligible to join this Section when they have attained the age of 6 years (although Beaver Colonies may take Beavers at the age of 5 years with the agreement of the Group Scout Master, that should only be granted when there is an oversupply of regularly attending Scouters/Officers available). They transfer to the Wolf Cub Pack when they have achieved the age of 8 years or after 7.5 years if they have passed all their required badges and gained the 'Swimming Up' Badge. The Beaver Section is not a training section as such but is a corporate activity base for young children that will assist in the child's personal development and get them use to team working and friendship. The activities can be varied; outings, games, corporate projects, etc. but should not overlap with the activities of the Section above the Wolf Cubs. Each Section to be kept distinct from the other as far as possible, but still offer a degree of challenge appropriate to the age group. 'I promise to do my best, to obey my Leaders and my parents and to be a good Beaver'. 'A Beaver is always busy and bright and helps other people by doing a good turn every day'. All Beavers are to wear the standard form of uniform for the Beaver Section. The Section colour is grey. As members of a Scout Group the Colony wears the same colour and patterned neckerchief of the Scout Group. Smartness of uniform is an important feature with the BBS. for all its Sections and leadership. GARTERS Garters to have Scout Green (Emerald Green) tabs. SHOES Shoes are to be plain black school type shoes for parades and ceremonies, but black (not white) trainers may be worn for normal Colony meetings. Beaver Scouters/Officers wear uniform as for the other Section Scouters/Officers within the Scout Group. BBS & BGS ARROW BADGES Two of these Association badges are worn, one on the right breast of the jersey and one on the right arm at the same height as the breast badge. SCOUT GROUP NAMETAPE The Scout Group nametape is worn at the top of the right arm shoulder of the jersey, following the shoulder seam around. ORDER OF WORLD SCOUTS BADGE ~ This badge is worn on the right breast of the jersey just below the BBS & BGS Arrow badge. This badge is the badge worn by all members of the international 'Order of World Scouts' (OWS), the international membership badge. SERVICE TAIL BADGES - There are three 'Service Tail' badge that are worn on the 'V' part of the neckerchief. 'Brown Tail' badge for a Beaver of 5 years of age (if applicable within the Colony); 'Blue Tail' badge for a Beaver of 6 years of age and a 'White Tail' badge for Beavers of 7 years of age. The 'Helpful Beaver', the 'Active Beaver', the 'Handcraft Beaver' and the 'Nature Beaver' badges are worn on the right arm of the jersey with the first badge earned set 1cm. below the 'Safe Beaver' badge in a diamond formation with the paw pointing upwards; the second and third badge earned are worn either side of the first badge directly under this with one side touching the first badge; and finally the forth badge earned completes the diamond formation of the four badges by being worn under the other three and connecting two of the above lower diamond sides. See the badge illustrations. The Beaver Colony is divided into Lodges as described above comprising approximately 6 Beavers per lodge. The Lodges are known by a colour for example ~ 'Red Lodge'; 'Blue Lodge'; 'Yellow Lodge'; White Lodge', 'Green Lodge', 'Brown Lodge', etc. and are the members of each lodge are identified by their Lodge coloured neckerchief woggle. Each Lodge will have appointed a 'LODGE LEADER' and a 'LODGE SECONDER', usually the oldest Beavers in the Lodge or the ones who have passed the most tests/achieved the most badges. The role of the 'LODGE LEADER' assisted by the 'LODGE SECONDER' is to ensure the good order of their Lodge, seeing that they are smart for inspections, act as a team in games and other activities. The 'LODGE LEADER' wears two 15mm (1.5cm) white ribbons/tapes around the upper part of the jersey arm midway between the elbow and the shoulder with a gap between the tapes equal approximately to the width of the ribbon. The ribbon/tape is sewn fully around the arm of the jersey, a complete band. The 'LODGE SECONDER' wears the same white ribbon/tape, but only one band of the ribbon/tape on the left arm in the same position as the 'Lodge Leader'. In addition the Beaver Master may appoint a 'COLONY LEADER' who will wear three white ribbons/tapes as described above. Special responsibilities and duties should be allocated to the 'COLONY LEADER' that encompass the taking part of the efficient running of the Beaver Colony to justify the role. The Colony cannot exist in isolation as it is, nor should be, it must be a Section of a Scout Group (unless a new group just forming with Beaver to start). There must be contact and interactions with the Wolf Cub Pack and the Scout Troop on regular occasions, particularly as these are the Sections that the Beaver will finally go to. Knowing other Scouters/Officers and members of other Sections will help the Beaver to understand that he/she is a member of a family in Scouting. The 'Swimming Up' badge will help to forge links between the Beavers and the Wolf Cubs, as well as the 'Swimming Up Ceremony'. Joint activities like hikes; parent and members games; Christmas parties; parades, etc. Joint activities with children of comparable ages in other organisations such as the Rainbows and other associations' Beaver Colonies, or competitions with school teams are to be encouraged. As our aim is the promotion of our Scouting and all it stands for, and to be seen taking a useful role in community activities and society, we must therefore participate in outside activities and fully support these activities; and not permit the membership to be lukewarm in their participation of these joint or share activities, thereby letting the Scout Group down. Of course contact and co-operation needs to be maintained with your local playgroups, nursery and local infant schools as these are the most likely sources of your future Beavers. We are principally a Christian Scout Association as such Church Parades and attendance at one's own Church is an essential element for Scouting, embedded in its Scout Promise and Scout Law. Therefore Beavers must be encouraged to fully participate in all the Scout Group Church Parades, particularly the St. George's Day Church Parade where the Beavers re-affirm their Beaver Promise and Beaver Law. Monthly Church Parades are recommended in order to fulfil the important elements within the Scout Promise and Scout Law with minimum attendance targets set for members. Beavers enjoy Church Parades, the marching, the Hymn singing, the pride in being seen in uniform and carrying their Section flag, thereby reinforcing their part played in the family of Scouting. And of course other youngsters see them and want to join. The programme of activities should be appropriate to the 6 and 7 year olds and should avoid anything which may be part of the Wolf Cub training Programme. As well as outdoor activities the programme should consist of, amongst other things, games with a purpose to promote character building and self-reliance, a sense of duty to others, fun, sportsmanship and interest in the outdoors. Sample programmes can be obtained from the BBS Headquarters on request. Where a Beaver Colony is part of a Sea Scout or Air Scout Group, Beavers must receive only Beaver training; and the designation and uniform of the Beavers must be the same as for other Beavers and no form of sea or air training may be given. The Beaver Programme is designed to develop and stimulate the Beaver and to give a variety and interest to the Programme. It is progressive throughout the period between 6 years (5 years if applicable) and 8 years of age and should be spread over the full, normal programme in such a way as to slowly progress by completing no more than ONE badge per term, interspersed with other activities, or programme extensions. The Scheme comprises of a Tenderpad or Investiture (Kitten) Badge or membership badge; the 'Safe Beaver' Badge; FOUR Progress (Footprint) Badges and finally the 'Swimming Up' Badge. Have completed three months service since being Invested. Take part in a Colony Good Turn. Take part in an adventurous Colony Activity. Take part in a Colony Nature Walk. Visited and taken part in a Wolf Cub Pack meeting or activity. Now the Beaver can look forward to their 'Swimming Up' Ceremony and joining the Wolf Cub Pack. NB: Beaver Colony Progress Charts (A3 Display Charts For Wall Hanging) Can Be Obtained From The BBS Headquarters On Request. The Beaver is a member of the rodent family and is a remarkable animal, weighing between 3 and 5 stones (19 to 32 kilos) and being 3 to 4 feet (99 to 122 cms) long. Because it has webbed hind feet the beaver is able to swim as fast as some fish and it can stay under water for a considerable time. Beavers in one form or another have been around for a long time and at least since the Ice Age, some 15,000 years ago. Beavers are engineers, skilled in tree-felling, dam construction and construction of canals. They have gnawing teeth and bite through the trunks of trees near to water. These trees then fall into the water and assist the beaver in dam construction. Together with sticks, small logs and mud, these trees hold back ponds up to 800metres (0.5 mile) long and as much as 73metres (80 yards) wide or more. The upstream side of the dam has a covering of mud and stones which trap the debris being carried downstream and helps to make the dam stronger. The pond created behind the dam is essential to the beaver to provide protection and to assist in transporting logs. Canals are built by the beavers to transport logs to the ponds and are straight and deep enough for adults to canoe in. The canals are lengthened as the trees are cut back. Dams are built across the canals as locks are built across our canals and rivers, in series, in order to get the water deep enough to float logs in. Burrows are built with underwater entrances in the canal sides to provide beavers with refuges. Beavers live in lodges which can be quite large. They are made from twigs, logs and mud. A base is built up to water level and at the centre a pile of mud about 60cms (2 feet) is laid and covered with twigs and small logs to about 2 metres (6 feet) in height. The entrance is made upwards from under the water level through the base to the mud. The mud is then removed. The beaver also provides two entrances for safety purposes. In the lodge the parents and their young (kit) live. The couple will produce three or four kits each Spring. The kits, soon learn to swim and will usually stay with their parents for a period of up to two years, then going out to find a mate and build their own dam. They will only mate with the same beaver and will live to be about 12 to 15 years. Beavers, like humans, take a holiday in the Summer and travel long distances, exploring the waterways and countryside around their ponds, spying out the streams and timber. When Autumn comes they prepare for Winter by cutting a large supply of food, storing this underwater for use when the ponds are covered in ice. Beavers are useful to humans as the dams they build regulate water flow in streams and prevent flooding. After being endangered species they are once again spreading across North America and have now been reintroduced into the waterways of the United Kingdom where they again appear to be prospering. It is unlikely that the Beavers will be able to play a musical instrument apart from maybe one or two. The main objective at first is to get the Beavers to take part in Colony music making, commence with learning and singing a few simple songs preferably those with actions, and then working up to more involved singing exercises. Enjoyment and entertainment are the two necessary objectives. Try to teach the traditional Camp Fire songs so that they become familiar with these for when they move up into Section that go camping and hold traditional 'Camp Fires'. This old man played one. Kentucky Fried Chicken and a Pizza Hut. As with other parts of the Colony programme the singing and music session should not be long so that the Beavers get bored, but should be long enough for them to enter into the spirit of the things and achieve a good end result. if you're not a Beaver you're no good to me. but the bonnie wee Beaver's the pride of them aw'. And this is the song that we sing all the while. Let's all be BUSY AND BRIGHT. We'll all be BUSY AND BRIGHT. And he flicked it 'til it flew away. (action song - repeat, leaving out one more thing each time). I'm A Beaver, Cut That Out. Hark, don't you? Hark don't you? (can be sung as a round). There'd be nine brown beavers building up a dam. (etc. down to one brown beaver building up a dam). We've got to leave you now. Happily we swim away, down to Beaver pond. O Lord, kum ba yah. O Lord, come by here. We trust that this handbook will be found of great assistance. If you have any questions or requests for further information, then please contact the BBS Headquaters. Wishing you a great beavering future.